Yes, I write that title with an exclamation point because – yay! Prosciutto! But wait a moment, you say. Isn’t prosciutto made from ham? From pig? Well, yes, traditionally it is. But at the time we decided to make this, we didn’t (and still don't) have access to a fresh ham that we can salt and cure, so we went this route. And making duck prosciutto is SO easy, why not give it a try, we encouraged ourselves. Yeah, we’re all about fusion here. For New Year’s Eve, Bill made Peking Duck. We haven’t done this in YEARS – not since before we bought this house, and we’ve been here about nine and a half years. So that’s a long time. We’ve been wanting to do Peking Duck lately, and this was the perfect opportunity. We had friends coming that night, so why not trot out something special, right? I made something like this sevaral years ago for either Valentine's day or for Bill's birthday (also this month) - it was part of a larger menu that included Napoleons of goat cheese and asparagus...um...slices of baguette with oil and garlic and brie...wines...and I don't even remember what I made for dessert. Best (I use the term with a heavy splash of irony here) of all, I had a horrible cold at the time, and couldn't taste a thing. Not a thing. In fact, the only time I COULD taste anything, was if I had just sneezed and my sinuses were clear for a second and a half, and I sort of breathed the taste of the food up into my nasal passages through the back of my throat. I know, it sounds rather strange and disgusting. But it was kind of thrilling the two or three times I could actually taste what I'd cooked. Bill seemed to enjoy the food, at least. Anyway, I figured I'd make less food this time around and just focus on the duck as the "showpiece" of the meal. 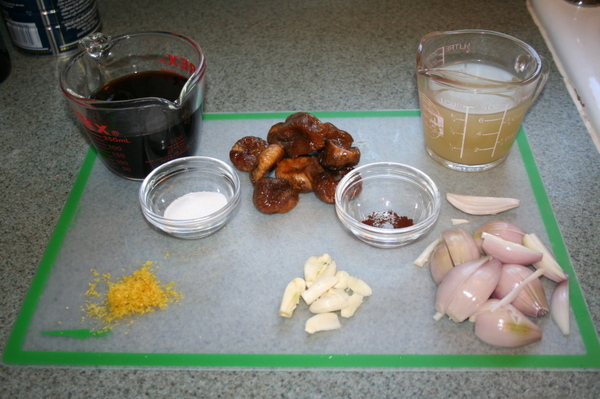 First, measure out the, figs, shallots, garlic, lemon zest, sugar, wine, and chicken stock. Hm. Okay, I'm going to tell you one way of doing it - the way I did it when I took these pictures, and then at the end of the post I'm going to give you an alternate version that I believe will actually be better, and it's how I SHOULD have done it, but for whatever reason, I didn't. Confused? Great! Let's continue. and cook for about 5 minutes, or until they start to soften. 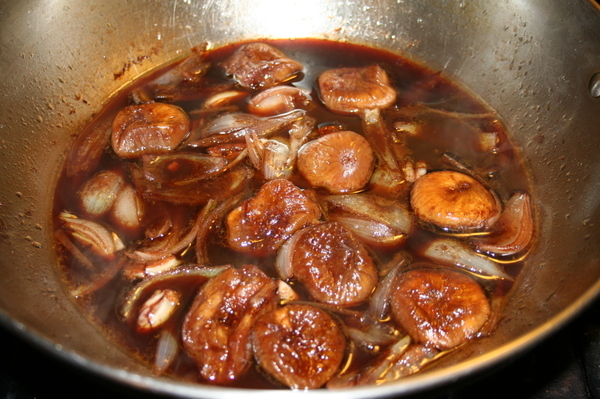 Add in the garlic and cook for another couple of minutes, and then add the rest - wine, chicken stock, sugar, zest, cloves, and figs. Bring to a boil, and then reduce the heat and simmer for about half an hour. Add salt and pepper to taste. While that's simmering, preheat your oven to 400 degrees. Start cooking the rice according to the package directions. 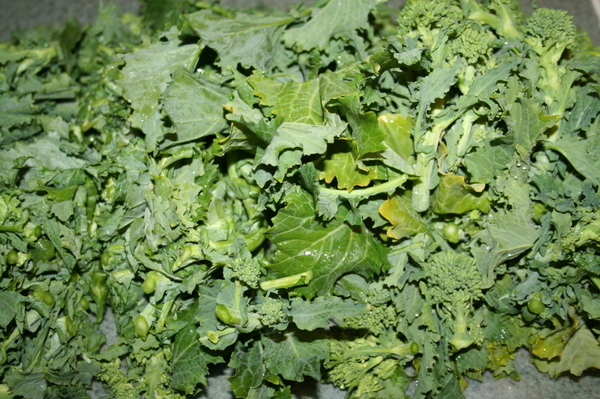 Rinse the broccoli rabe and trim off the ends of the stalks. Chop the rabe stalks into thirds and set aside. 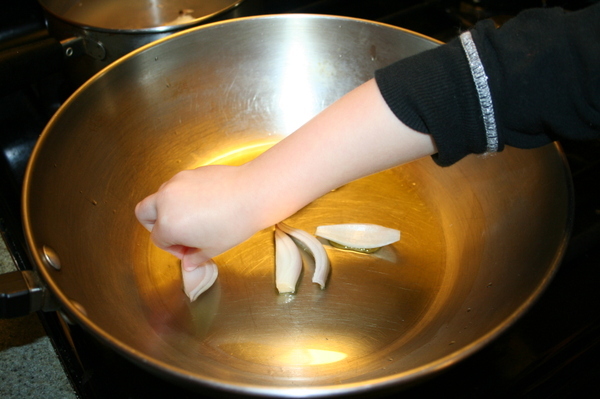 Now, smash a few garlic cloves and peel the paper off. Place these in a large saucepan with a few tablespoons of olive oil. 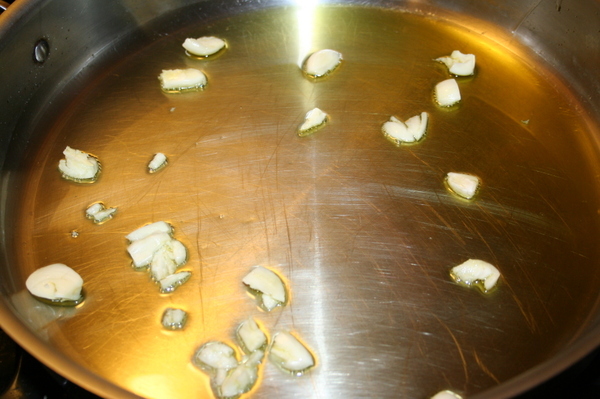 Heat the pan until the oil is warm, but you don't want to cook the garlic. Once the oil is hot, shut the heat off, and just let the garlic sit there and soften. 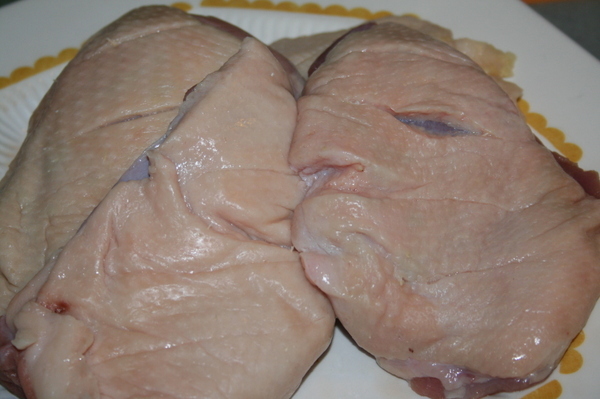 Now, rinse off the duck breasts and pat them dry with paper towels. You need to get a sharp knife, and score the skin in a grid pattern - just cut around halfway through the skin and underlying fat - don't cut into the meat below. 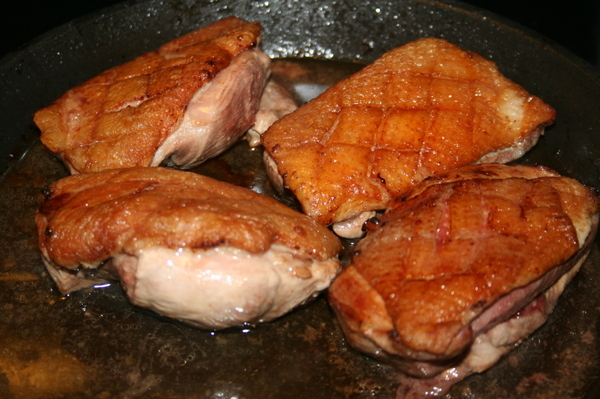 Place an oven-proof pan over a medium high flame, and when the pan is hot, place the duck breasts, skin side down, on the pan. Cook until the skins are golden brown and crisp, and the fat has been rendered. Spoon the fat out of the pan as it accumulates. This should take about 5-8 minutes. At this point, turn the duck breasts over in the pan and place them, uncovered, in the hot oven. Cook until the internal temperature registers 165 F with a meat thermometer. Actually, I'd take them out sooner, like when it's around 160. They'll continue to cook a bit more after that. While the duck is in the oven, heat the oil and garlic back up again and place all the broccoli rabe in the pan, too. Stir or toss to coat the rabe with the oil, and sprinkle with salt and pepper. Place a lid on the pan and let it cook a while on medium until the rabe wilts. 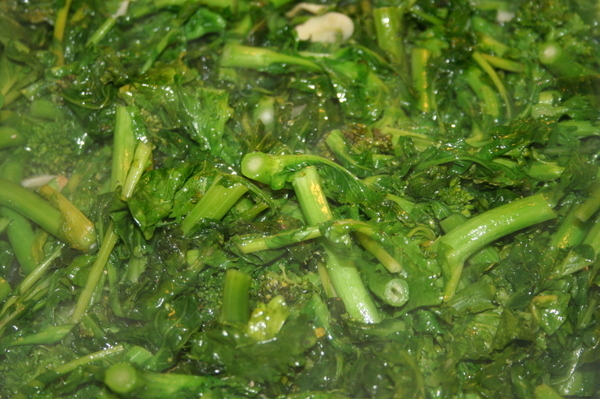 Remove the lid and cook, stirring occasionally, until the stalks are tender, about 8-10 minutes. By this point the rice should be done cooking. 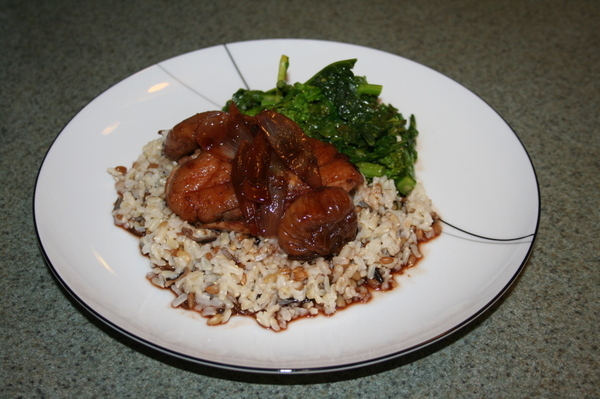 Now all you need to do is warm up the fig/shallot mixture and serve. 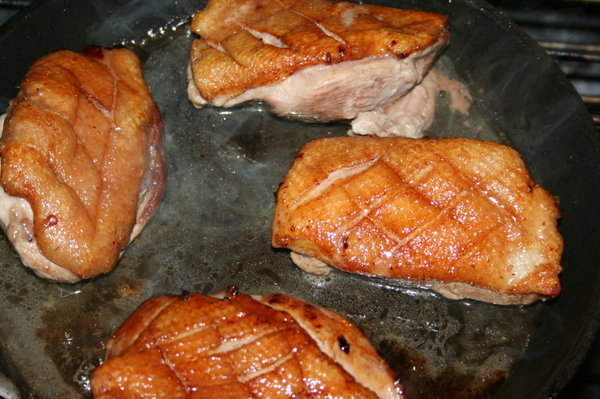 FIRST, brown the duck breasts in a large pan. Remove them and set aside on a plate. THEN, saute your shallots and garlic in the oil, add the rest of the ingredients for the fig/shallot mixture and cook together for about ten minutes or so. AND THEN, place the duck breasts, meat side down, in the shallot/fig mixture and cook on medium until the duck breasts are cooked through. Everything else would be done the same way as described above. 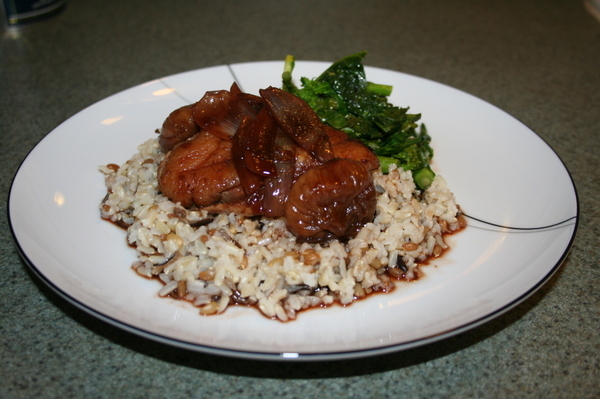 I think if you cook the duck in the sauce, it will absorb some of the flavors and it just seems to me you'll get an even better flavor.